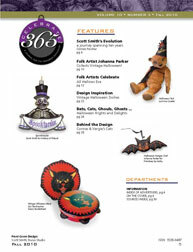 Halloween Issue in the Mail! 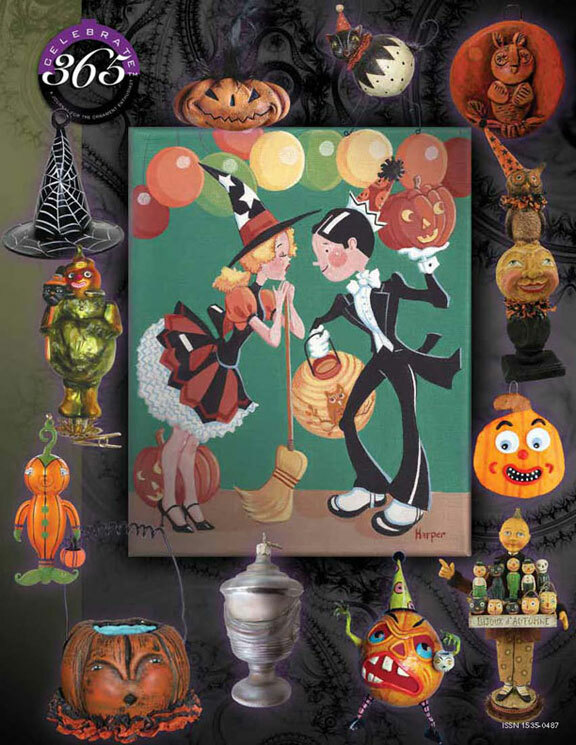 Inspiration: The illustrations of John Held Jr.
Joyce Stahl Pumpkin, $39.95; Johanna Parker for Bethany Lowe Designs Shriek the Cat, $34.99; Robert Brawley Who is On the Moon, $25; Debra Schoch for Bethany Lowe Designs Owl and Moon on Pedestal, $49.99; Becca Bilas, Jack-O-Lantern Pumpkin Ornament, $14; Allen Cunningham The Trinket Peddler, $165; Eric Cortina Estate Garden Urn, $32.50; Elaine Thomas Pumpkin Bucket, $38; JingleNog Jack-O, $80; Debbee Thibault Halloween Queen, $45; Soffieria De Carlini Witch’s Web, $38. Debbee Thibault & Kitty’s Ltd. Author Connie PorcherPosted on September 26, 2010 October 5, 2016 Categories Allen Cunningham, Amelia Schaeffer, Artistry of Poland, Bethany Lowe Designs, Bruce Elsass, Carrie Murtha, Christina's World, Christopher Radko, David Everett, De Carlini, Debbee Thibault, Debra Schoch, Dee Foust, design, Eric Cortina, Flora Thompson, folk art, Germany, Ghoultide Gathering, glass ornament, Greg Guedel, Halloween, Inge-glas of Germany, Italian free blown, JingleNog, Laurie Hardin, Lori Rudolph, Old World Christmas, ornament, Patricia Breen, Poland, Scott Smith - Rucus Studio, Sheryl Parsons, Sue Pastor, SweetB, Uncategorized, Vaillancourt Folk Art, Vergie Lightfoot, vintage Halloween4 Comments on Halloween Issue in the Mail! 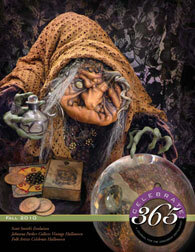 The Halloween issue of Celebrate365 is off to the printer tomorrow morning. This is was created electronically in its entirety. No proofs printer or sent, all digital images, pdf proofs … There’s definitely a learning curve but we survived the new experience and I think we can continue. The Halloween issue continues to outsell all the other seasons. This year, Celebrate365 received submissions from 71 different artists, designers and manufacturers. Talking about record-setting participation! This just might be the best issue in our history … well you can tell us! We anticipate shipping this issue during the last week of September. Want to order a single copy? No problem. Please CLICK here! You’ll find a quick preview of what you’ll read about in this upcoming issue! Author Connie PorcherPosted on September 12, 2010 Categories Allen Cunningham, Bethany Lowe Designs, Carrie Murtha, Christina's World, David Everett, Debbee Thibault, Debra Schoch, Dee Foust, Eric Cortina, folk art, Ghoultide Gathering, glass ornament, Halloween, Inge-glas of Germany, Italian free blown, JingleNog, Laurie Hardin, Lori Rudolph, Old World Christmas, ornament, Patricia Breen, Scott Smith - Rucus Studio, Sheryl Parsons, Vaillancourt Folk Art, Vergie Lightfoot6 Comments on Halloween is on the way! Can you match the designer with his or her creation?